Authorities have charged the owner of one of the country’s only independent media outlets with sedition. On human rights and freedom of thought and expression, Cambodia has found the going tough. Stories about villagers evicted from their land, human rights workers being arrested, and those who prefer the opposition to the ruling Cambodian People’s Party (CPP) being harassed are the stuff of daily headlines. Chief among them is Mam Sonando, 70, Director of the independent Beehive Radio and President of the Democrat Association. He was arrested at his home on July 15 by about 20 police officers after being accused of leading a secessionist movement in northern Kratie province. He is currently being held without bail even though the he returned willingly from overseas to answer questions despite having been jailed twice before for criticizing the government and taking a vocal stand against forced evictions and alleged land grabbing. 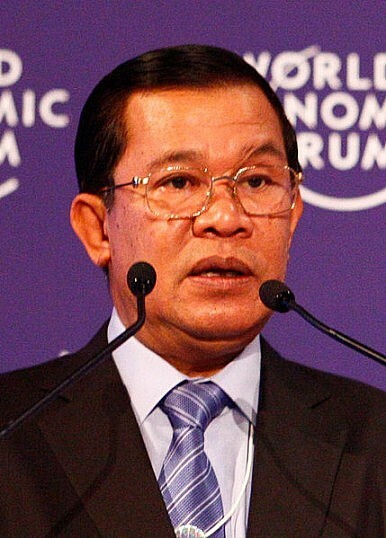 Mam Sonando’s supporters believe his arrest was connected with a broadcast on Beehive that discussed a communication that was delivered to the Office of the Prosecutor of the International Criminal Court (ICC) by the head of the Khmer People Power Movement (KPPM), Suon Serey Rath, alleging government involvement in crimes against humanity. Beehive carries programing by the Voice of America, Radio Free Asia, Radio France International, and local opposition and minor political parties. His arrest came one day after the broadcast and, according to the Cambodian Center for Human Rights (CCHR), was another example of the government using a politically pliant judicial system to intimidate and silence opposition. Accusations of a secessionist movement were linked to a long-running land dispute in Kratie involving a Russian company, Casotim, which won a 15,000-hectare economic land concession. In May, hundreds of armed police and military personnel stormed Pro Ma village and evicted a thousand families living in the concession. The authorities opened fire and killed 14-year-old Heng Chantha when the villagers refused to leave. This was despite a halt on the granting of land concessions and promises by Prime Minister Hun Sen to review previous land grants. Following the death of Heng Chantha, police arrested a number of villagers and alleged they were secessionists seeking to gain independence from Cambodia. The government claimed that the so-called secessionists had been plotting with the Democrat Association led by Mam Sonando. PM Hun Sen then called for his arrest claiming Mam Sonando was leading a subversive plot to overthrow his government and attempting to establish a state within a state. CCHR says the charges appear to be an attempt to create an alternative narrative of the events that took place in Kratie and effectively divert attention from the state security forces’ responsibility for the death of Heng Chantha. Fellow journalists have also rallied. Robert Carmichael, the President of the Overseas Press Club of Cambodia said his detention looks to be an alarming escalation in actions carried out by the government against the media and free speech. “The government has linked the most serious charge – that of insurrection – to the violent eviction of villagers in Kratie province earlier this year during which a 14-year-old girl was shot dead by the authorities,” a statement by the Overseas Press Club of Cambodia said. “The allegation that the villagers were trying to secede has been widely ridiculed as a fabrication, and there is consequently little reason to see the related charge against Mam Sonando in any other light. Furthermore, the authorities have offered no evidence to substantiate any of the other charges against Mam Sonando, who is also the president of local NGO the Association of Democrats,” the statement added. The Overseas Press of Cambodia went on to note that such crackdowns often take place in the run-up to elections. Polls are due mid-next year. The CCHR and OPCC were not alone in urging the government of Cambodia, which is the current ASEAN chair and a prospective member of the United Nations Security Council for 2013-14, to release Mam Sonando immediately. But given the government’s track record on human rights, such a release remains highly unlikely. His case is due before the Cambodian courts soon. ASEAN’s recent declaration on human rights has been met with criticism from a broad spectrum of groups.